The Kentucky Derby. The World Cup. The Super Bowl. The Olympics. The Epcot Food and Wine Festival. If I were seriously ranking these epic events, I would put Food and Wine on top. By a ton. 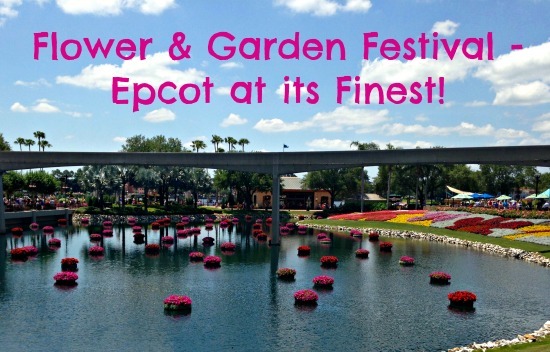 The anticipation for this Fall (now technically still Summer) festival starts to build as soon as the Epcot Flower and Garden Festival ends. First, there is the release of the new Epcot Food and Wine Festival menus. Then, in July, the Epcot Food and Wine Festival Preview Luncheon. That’s when it gets real. Finally, there is the menu research, the mapping, the strategizing, the long days in the gym, the fasting, the stretching. Ha! Just kidding, I totally wing it! Seriously though, there are a few basic tips I can offer to help expedite the consumption of as many different plates as possible. The best bit of information I can give you is to start your day at 11:00 a.m. sharp, when the World Showcase fully opens. The crowds are lighter, and you can really do some damage in that first hour. Also, I like to start my tour on the back (South) side of the lagoon, and work my way towards the front. Invariably, EVERYONE stops at Mexico or Canada first. Don’t be that guy! Cruise on past and head to daylight. You will be a hero as you hit at least 3 kitchens before the masses even get their first taco! One small adjustment to this strategy is there are now 9 kitchens located in the area between Future World and World Showcase. This will gobble up some of the crowd, so the south side start isn’t quite as mandatory as it has been in the past. I still stand by it, but I will let you decide. I’ll assume, by now, that you have decided to follow my plan and are standing in front of the American Adventure. STARVING. Passports in one hand, a plastic fork in the other. A fully loaded gift card in your wallet. Wads of fresh napkins stuffed in both pockets. Lets do this!! 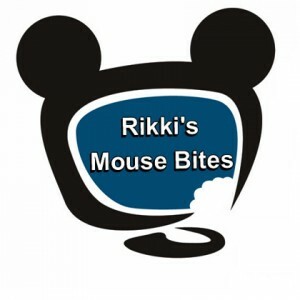 I will create two plans of attack featuring my favorites and my not-so-favorites. One heading towards Japan, and the other heading towards Italy. 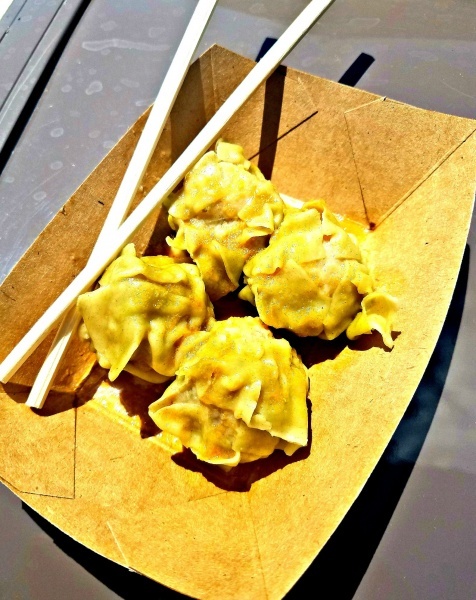 JAPAN….Wasabi Shumai Pork Dumplings Lots of rice wine vinegar makes for a tart little dumpling. I like it! Spicy too. MOROCCO….Spicy Hummus Fries Thick planks of hummus, fried until crispy. Unbelievably good. Cuke/tomato salad really pops. Excellent returner. BELGIUM….Belgian Waffle with Warm Chocolate Ganache Crispy waffle with gooey chocolate goodness. Yes please. BRAZIL….Crispy Pork Belly That’s all that needs to be said. Black beans are fabulous. Please eat this. Next year, too! And the next! FRANCE….Croissant aux Escargot The snails in France are always great, regardless of the set. Boeuf Bourguignon Very boring beef dish. Every year! Pass. IRELAND….Warm Cheddar Cheese Dip Dense and nutty bread make the perfect dippers. The rich and delightfully bitter cheese dip is a winner. Great sharable. Warm Chocolate Pudding Lots of dairy if you pair it with the cheese dip, but worth it. Irish Cream makes the dish. CANADA….Le Cellier Wild Mushroom Beef Filet A classic. Your mind would be blown if you knew how much beef they actually go through in 75 days. Great mushroom sauce. Also, a pretty good value. Must do. WINE AND DINE STUDIO….Seared Scallops and Duck Confit are two of my all-time favorites. Very safe choices. Enjoy with my blessing. 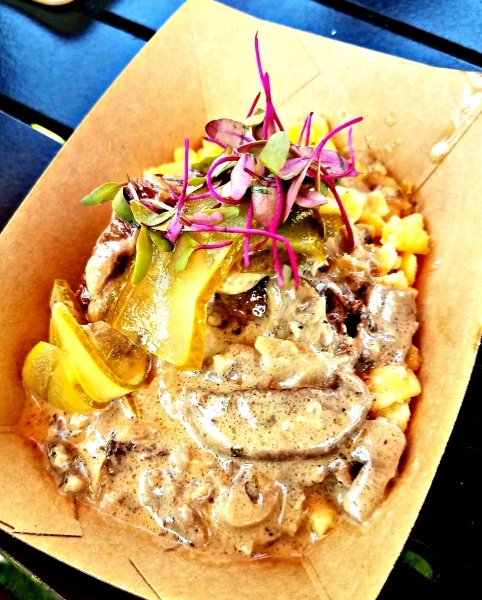 CHEESE STUDIO….Braised Beef Stroganoff Melty tender beef. Chewy noodles. Creamy sauce. And the pickles..the pickles!! Fabulous dish. CHOCOLATE STUDIO….Liquid Nitro Chocolate-Almond Truffle The presentation alone is worth it. Watching a rookie line-cook lower that ball of chocolate goodness into a bubbling bath of deadly nitrogen, so cold it will burn you, all while sweating profusely in a 12X12 plywood box in the middle of a 1000 degree Florida afternoon. Epic. But, they pull it off every time! Come for the show, stay for the chocolate. 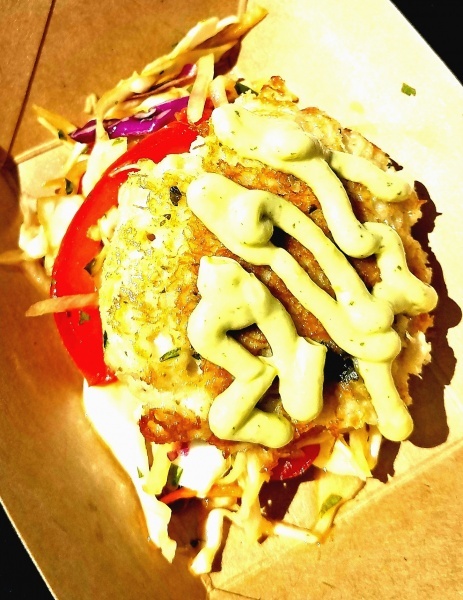 COASTAL EATS…. Lump Crab Cake Real lump crab. Nice and tart avocado cream. Good slaw. Worth it. Seared Scallops I like this version of scallops a little better than the classic version from the Wine and Dine Studio. The butterbean succotash is the star of the dish. 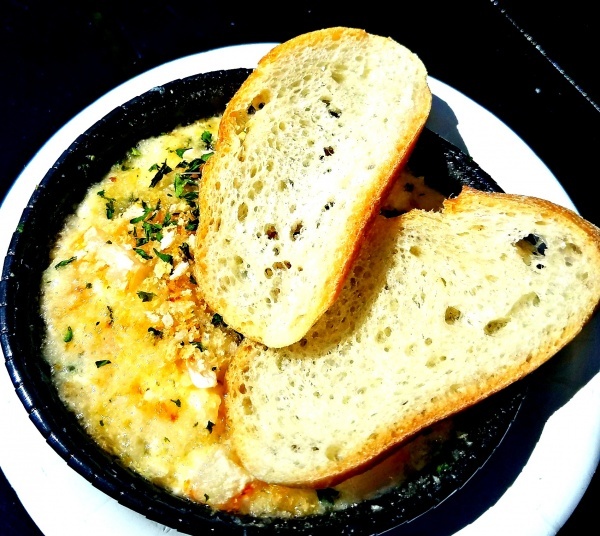 Baked Shrimp Scampi Dip Great little shareable “casserole” of shrimp and cheese. Garlicky and gooey. ACTIVE EATS….Loaded Mac n Cheese Boring. Again. Pass. Sweet Avocado Crema One of my favorite new desserts. Creamy and not too sweet. Love the use of avocado here. Crunchy sweet/salty tortilla topping seals the deal. Dessert guac? Yes! 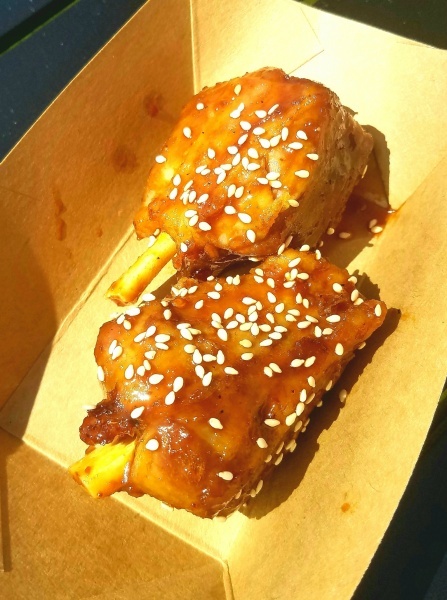 FLAVORS FROM FIRE….Piggy Wings Tender and porky “wings” are glazed with a sweet and sticky Korean BBQ. Perfect. Thank you for bringing this back, and thank you for not making me walk all the way to the Odyssey Center to get them this year. 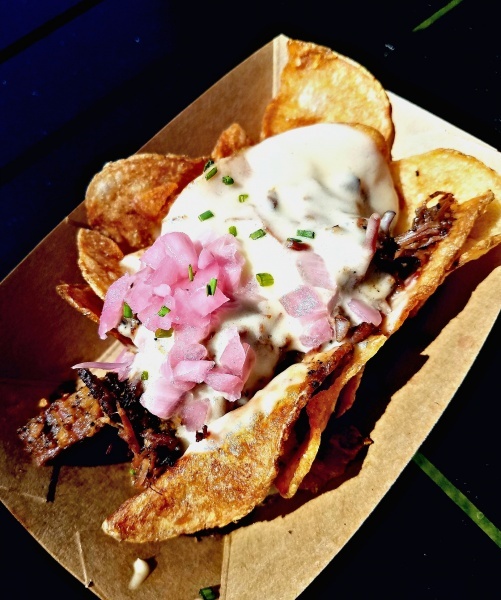 Smoked Corned Beef Tender shards of this smoky brisket are piled on crispy housemade chips. Beer cheese fondue rocks. Irish nachos! Top 5 this year, top 10 all-time. Round one of the Epcot Food and Wine Festival in the books. Welcome to my world. I hope you enjoyed my best of the Western half of the lagoon. Depending on your pace, and how many people are in your party, you should be able to knock this out in a few hours. That leaves plenty of time in the afternoon to float around your resort pool like a manatee. My next tip is eat a light dinner, hit the bed early, and get ready for round two! 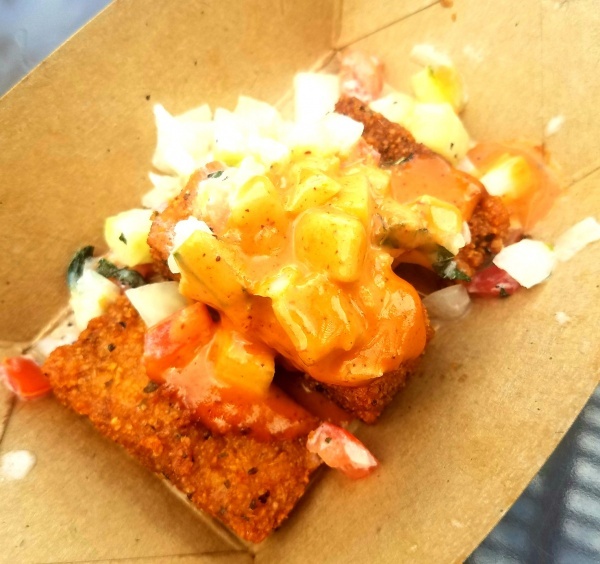 Stay tuned for the rest of my picks of the rest of the Epcot Food and Wine Festival in part two of this blog. 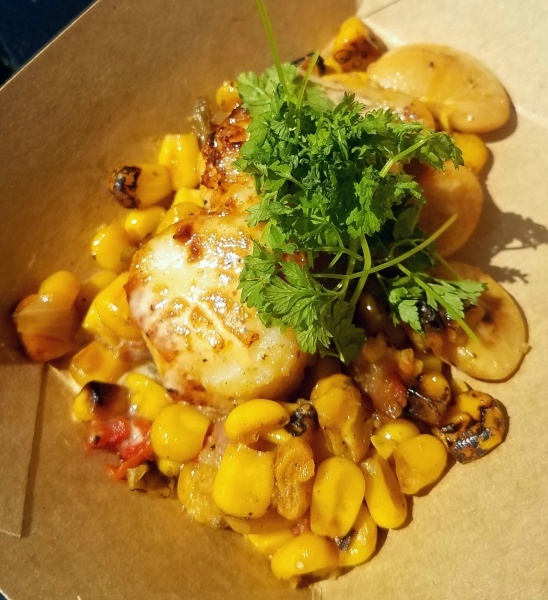 What are your favorite dishes from these particular booths at the Epcot Food and Wine Festival? Share them in the comments.